Sealcoating protects your West Fenwick asphalt surface from harsh weather, hazardous chemicals, and every day wear and tear. It also minimizes the potential for cracks and potholes. Tom McDonald Contracting has been in the paving business in Delaware for 29 years. Call the paving experts at (302) 219-7939 for your West Fenwick residential or West Fenwick commercial sealcoating job. 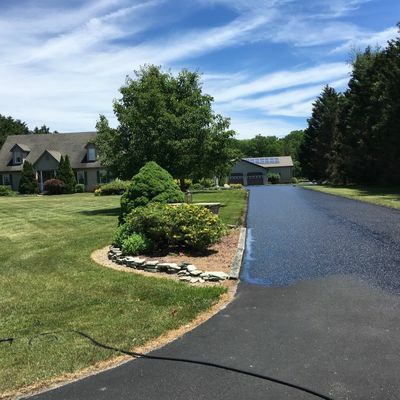 Need asphalt sealcoating in West Fenwick, Delaware? Sealcoat gives your West Fenwick asphalt a beautiful dark finish. More importantly, a smooth sealcoated asphalt surface makes your driveway or parking lot safe for your family, visitors, employees, or customers. It's a no brainer. If you take care of something, it lasts longer. Once you have asphalt erosion, frost heaves, or potholes, the only solution is to completely resurface your asphalt. Proper maintenance of your West Fenwick driveway or West Fenwick parking lot gives you peace of mind. It also saves you money by preventing costly repairs. For worry-free asphalt maintenance, call (302) 219-7939 to enquire about our West Fenwick residential and West Fenwick commercial service plans. Tom McDonald Contracting has been sealcoating residential and commercial asphalt surfaces in Delaware for 29 years. An asphalt driveway or parking lot doesn't last forever. But you can make it last longer by calling Tom McDonald Contracting for professional asphalt sealcoating. Protect your residential or commercial asphalt surface with a professional sealcoat application by Tom McDonald Contracting, West Fenwick's paving experts. Tom McDonald Contracting gets the job done right.